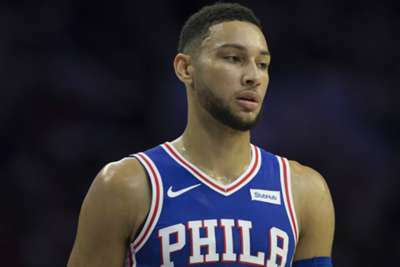 Ben Simmons looks better than his Rookie of the Year season and the Philadelphia 76ers are "definitely" in the hunt for the NBA Finals, according to former Chicago Bulls star and three-time champion Luc Longley. Simmons and the 76ers announced themselves in 2017-18 as Brett Brown's highly rated young team reached the Eastern Conference semi-finals following years of pain. After sitting out a year due to a foot injury, Simmons – the number one pick in 2016 – averaged 15.8 points, 8.2 assists and 8.1 rebounds during the regular season, while averaging 16.3 points, 9.4 rebounds and 7.7 assists in Philadelphia's first playoff campaign since 2011-12. Simmons has continued where he left off this season with a triple-double and double-double to his name already, and fellow Australian Longley – who was part of the Bulls' three-peat alongside Michael Jordan between 1996-98 – heaped praise on the 22-year-old. "Simmons delivered on a lot of his promise [last season]," Longley said in an interview with Omnisport. "Then had some great playoff experience against Boston. Knowing his competitive spirit, that would've driven him mad [losing that series]. "I watched every 76ers game I could get my hand on, just like half of Australia and the world, not because of [Joel] Embiid who is great but because of Simmons and how exciting he is to watch. "This season, he looks better. He looks very focused defensively and we're only early into the season. That excites me. He talks about wanting to be an All-NBA defender. Lots of guys have breakout years in their careers and it looks like he is putting pedal to the metal now after a breakout year." With Markelle Fultz – the top pick in 2017 – hampered by injury and form last season, Simmons was Philadelphia's primary point guard to great effect. Fultz, however, is back this season and in the 76ers' starting line-up, though Longley does not believe it will impact Simmons. "That's the great thing about Ben, he is so versatile," Longley said. "Having great players around him, will only make him better. "People have talked about worrying about whether he doesn’t have the ball as much or take away his shot but I don't think matters to him. I've heard Ben talk about being a player, not a position. That team is built that way. If Fultz can find his groove, that will work in Ben's favour in Philadelphia." With Simmons, Fultz and All-Star Joel Embiid at the core of Philadelphia's plans, 76ers head coach Brown has made no secret of his desire to feature in the NBA Finals. The 76ers were flying high last season before they were stopped in their tracks by Eastern Conference rivals the Celtics, who won the series 4-1. Asked about Brown and Philadelphia's ambitions, Longley added: "They're definitely in the Finals mix. I think Boston and themselves are the best teams in the east. That's one team away from the Finals. "They have a lot of work to do. It's fun to watch a young team like that figure out how to be consistent and we watched it last year. They figured it out last season. They got the acid test in the playoffs and they were found wanting a bit. "Watching a young team take that lesson on the nose and figure out how to get better and apply it through an 82-game grind and get to the playoffs in the right shape then beat someone like Boston. "That's just a fantastic storyline they're writing for themselves. There's no reasons why they can't do that. There's a lot that has to go right. It's different to let's say the [Golden State] Warriors, who have done it three times and trying to stay stimulated. Philadelphia are a highly stimulated team which makes them stimulating to watch."